On the following day Eduardo drove me up the road past the airport to look at the pulp mill, surrounded by its eucalypt plantations. I stood on the effluent outflow where the muck was dumped into the rio Cruces, probably no more than 20 metres wide at this point and fast flowing. There had been no attempt by the company to disguise the outflow or even to fence it off. There was no evidence of social embarrassment or cover up: CELCO was either demonstrating a commendable honesty and transparency or it didn’t give a stuff. No smoke or steam emanated from the mill because it was undergoing a maintenance shutdown. Eduardo spoke to a resident of a little hamlet nestled in the trees a few hundred metres down a muddy road from the mill. 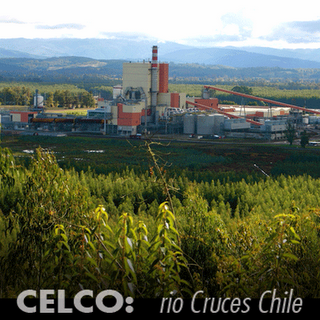 The stink from the mill had been atrocious at first he said – it had even been so 50 kilometres away in Valdivia – but now there was not much smell. As a result of the furore over the stink, the company installed odour treatment technology that should have been installed in the first place, and changed some operational procedures. To keep the people sweet who lived close to the mill, the company installed tap water in the few houses and put a couple of street lights on the muddy track that ran past the hamlet, the latter day equivalence, I suspect, of distributing beads and mirrors to the natives. On the boat the previous day there had been a conversation comparing the two pulp mill companies in Chile. CMPC, closely allied to the conservative parties in government, behaved, it was agreed, like a good corporate citizen. CELCO, close to the Christian Democrats, on the other hand, behaved in a way that was….. Sandra struggled for a word that I would understand. “Do you know ‘dumb’?” she asked. “Yes”, I replied. “Tasmanians know ‘dumb’. Sometimes I think we invented it”. If Tasmanians, notoriously insular when it suits us, are prepared to learn from the experience of other places, as we occasionally are when it suits us, then we might learn things that contradict the inherited wisdom of our social engineers, such as ‘big is best’, for instance, or the propaganda message that using up renewable resources like forests and water at an unsustainable rate is ‘world’s best practise’. For example, two economic arguments of the pro-mill lobby in Tasmania are a) the large number of local jobs that would be created in operating the mill and b) the big flow-on investment effect of the mill. I decided to test these two articles of faith by asking Dr. Jaramillo about the CELCO example. There are 300 people employed at the mill, he said. How many locals? 20. And what do they do at the mill? They clean the toilets. (Make allowance for the exaggerated simplicity of this reply: they probably clean other things as well). Where do the other 280 employees come from? Somewhere else. Santiago. Maybe other countries. Jobs in a pulp mill are specialist jobs: computer specialists, chemists, engineers etc. I doubt whether there were any unemployed people in the Valdivia region with those skills, he concluded. 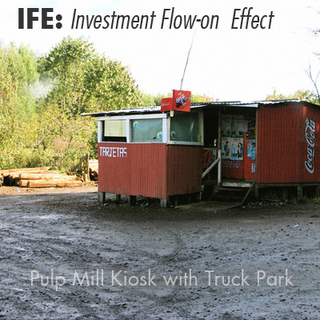 What about the flow-on investment effect of the mill? His reply was to drive me to a little red painted kiosk, like a slum humpy, standing in mud near the boundary fence of the mill. It was shut. Sometimes they might sell a beer to a log truck driver, said Eduardo. Next he showed me two holiday accommodation complexes of nicely built wooden cabins, diagonally opposite each other a kilometre back down the highway from the mill, both built during the construction phase of the mill on the promise of the prosperity the mill would bring to the area. One complex had never accommodated a single person and scrub was encroaching on the forlorn clearing in which it stood. The other, while it had a restaurant which had never served a meal, did at least have one car parked beside a cabin. Two shattered dreams and perhaps there was another in the making a further two kilometres down the road, that is, three kilometres from the mill. A fifty hectare blueberry plantation, newly established, filled up the landscape on the north side of the road. I advised them not to plant here, explained Eduardo, but they went ahead anyway. Every berry grown here is for export to Europe. While we may not test for dioxin contamination here, they will surely do so in Europe. Goodby one export business.